This event to open to everyone! Families and those wishing to volunteer at the Society are encouraged to attend. The evening includes socializing, a buffet dinner, and a presentation on the early history of Ridgway. Tickets are only $25 per person and are available for purchase at the Ridgway Chamber and Welcome Center, the Royal Inn, Cliffe’s & the Prescription Center in downtown Ridgway, McGrath CPA – Certified Public Accountant, and the Historical Society Office. This year’s presentation will be given by Robert (Bob) Imhof, who is the President of the Ridgway Heritage Council. Imhof has also written articles on the history of Ridgway, Elk County, and the surrounding region. His presentation will include interesting historical facts about the history of Ridgway and its namesake founder, Jacob Ridgway. 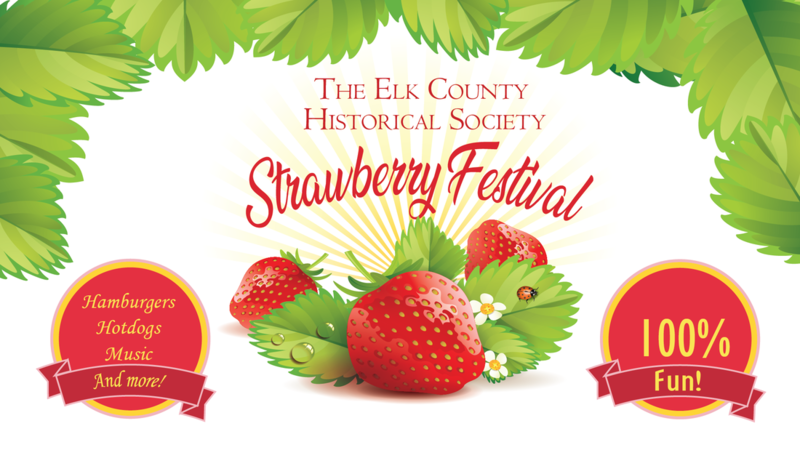 Our annual Strawberry Festival is a family favorite and our biggest fundraiser of the year! Join us for food, fun, music and more! Check back soon for details about the 2019 festival!